OSWEGO, NY — When restauranteur Laurie O’Brien opened Red Sun Fire Roasting Co. in 2010 with her husband, Will, she had a specific vision for their urban-style eatery. It was not until recently, however, that she discovered a chef who truly understood and shared her vision. 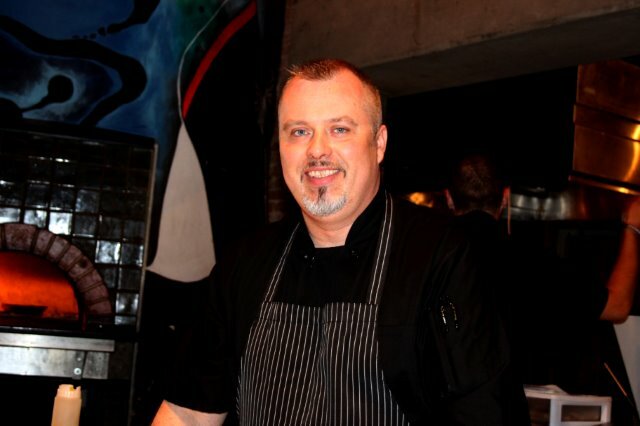 The Red Sun Fire Roasting Co. welcomes Peter Belmonte as its new chef. Belmonte is an award-winning executive chef who has worked in fine dining establishments, primarily in New York City. “My vision for the Red Sun was to serve California (Napa Valley-style) cuisine,” O’Brien said, explaining California cuisine to be a style of cuisine marked by an interest in fusion cuisine (integrating disparate cooking styles and ingredients) and the use of freshly prepared local ingredients. O’Brien was already owner and operator of Port City Cafe and Bakery for 14 years before she decided to open a full-service restaurant next door. Enter Chef Peter Belmonte, former Marine turned award-winning executive chef, who was recently hired to bring the O’Briens’ dream to life. Hailing from the Berkshires in Massachusetts, Belmonte has been a chef for 19 years and an executive chef since 1999. Prior to that, he served in the U.S. Marine Corps Security Force Battalion, a dedicated anti-terrorism unit. After his separation from the armed services, careful consideration led him to the New York Restaurant School. “Between 1999 and 2010 I worked in fine dining at restaurants attached to boutique hotels and resort inns in New York City and New England,” he said. Under Belmonte’s watch, his food received seven Four-Diamond Awards by AAA and, while working at The Inn at Thorne Hill, that establishment was rated on Conde Nast’s Gold List twice. O’Brien said she was impressed not only with Belmonte’s knowledge of California cuisine, but also his appreciation and understanding of rustic cuisine, which is another component of California fare. Along with O’Brien’s bakery manager of 16 years, Hedi Sprague, and new sous chef, Tony Kinnie, she feels the has finally assembled a very capable management team and is eager to show her revamped and exciting menu to Oswego and beyond. Overall, O’Brien said Belmonte’s food has been extremely well-received and business has been great.